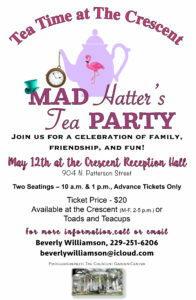 TeaTime at the Crescent – Mad Hatter’s Tea Party – will be held at the Crescent Reception Hall on May 12, 10:00AM and 1:00 PM. Tea Time at The Crescent is a lovely and elegant event held in the Reception Hall of the Crescent grounds. It is catered by Covington’s, a premier caterer in Valdosta. Individual tickets are available as well as full tables of eight, which can be reserved. The event in 2017 sold out and had a waiting list, so please contact us early. Each of the two seatings will be limited to 100 guests. Tickets are $20 and are available as advance sales only. This event sold out last year so please buy your tickets early! Please call Beverly Williamson 229-251-6206 if you wish to reserve a full table of eight.